Sickle Cell anaemia is thought to affect around 2% of Sierra Leoneans. 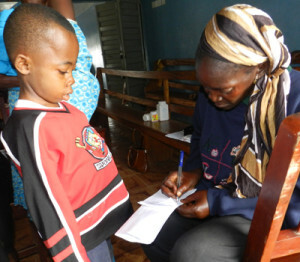 Those suffering from sickle cell anaemia in Sierra Leone have little or no access to support or medication. SCA is a major public health concern: national control programmes do not exist, the basic facilities to manage the patients are chiefly absent, and screening is only available in the capital, Freetown. Misdiagnosis is common, with many health workers interpreting the symptoms as malaria. The diagnosis is usually made when a patient presents with a severe complication or ‘crises’. It is estimated that 80% of children with sickle cell anaemia do not reach their 5th birthday. Medical Assistance Sierra Leone is working with the Sickle Cell Carer’s Awareness Network (SCCAN) to support those affected by sickle cell anaemia in Kono District. Three types of medication are being provided to a pilot group of 100 young patients to enable them to manage their condition, with advice and support provided by a nurse experienced in sickle cell management. SCCAN and MASL are fundraising to purchase electrophoresis equipment for screenings (basic laboratory tests are currently carried out on request which are not accurate enough). In total approximately 20 – 30% of people have sickle cell trait and are carriers of the sickle haemoglobin gene. The electrophoresis equipment will be hosted at Kono District Hospital. Screening will be routinely offered to all newborns and will be used as part of a district wide screening programme to inform and advise people on their status. Information on managing the condition, on nutritional support and counselling regarding relationships will be offered by the SCCAN team. People with sickle cell disorders need to keep warm and dry to prevent sickle cell attacks or ‘crises’. Blankets, hats and hot water bottles can help greatly. For young people (but not infants) muscle pain can be alleviated with pain-relieving gels. Please consider helping the sickle cell patients in Kono with essential items – you can buy direct from this Amazon list on the right and the goods will be delivered to us. We will then ship them out to Sierra Leone where they will be distributed to sickle cell patients registered at the Kono District Hospital through the programme with SCCAN.